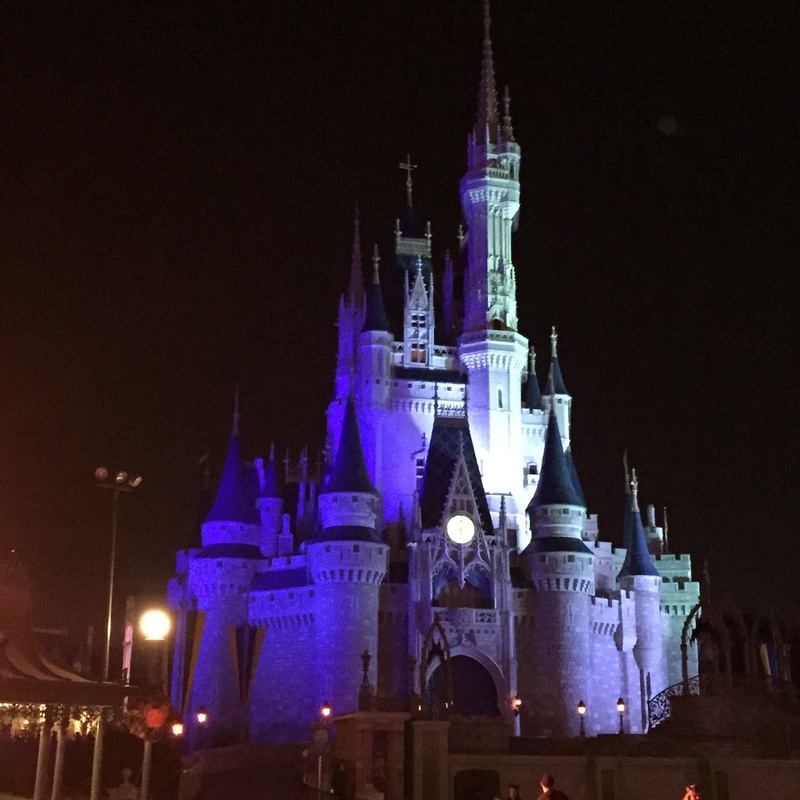 I wrote a guest post for my friend Sarah's disney blog, Memory Making Moms all about our Mickey's Not So Scary Halloween Party (MNSSHP) experience. So if you saw that, you will have read most of what is below already. But I wanted to include all the info and pictures here as well. We loved the party and it was definitely a highlight of our whole trip. The party takes place officially from 7 pm until midnight, but with just a little research you quickly learn that you can get into the park as early as 4 pm with just a party ticket. We knew it would be a long night so we spent just a couple of hours in Epcot that morning and went back to our resort for a good afternoon nap and rest time before the party. 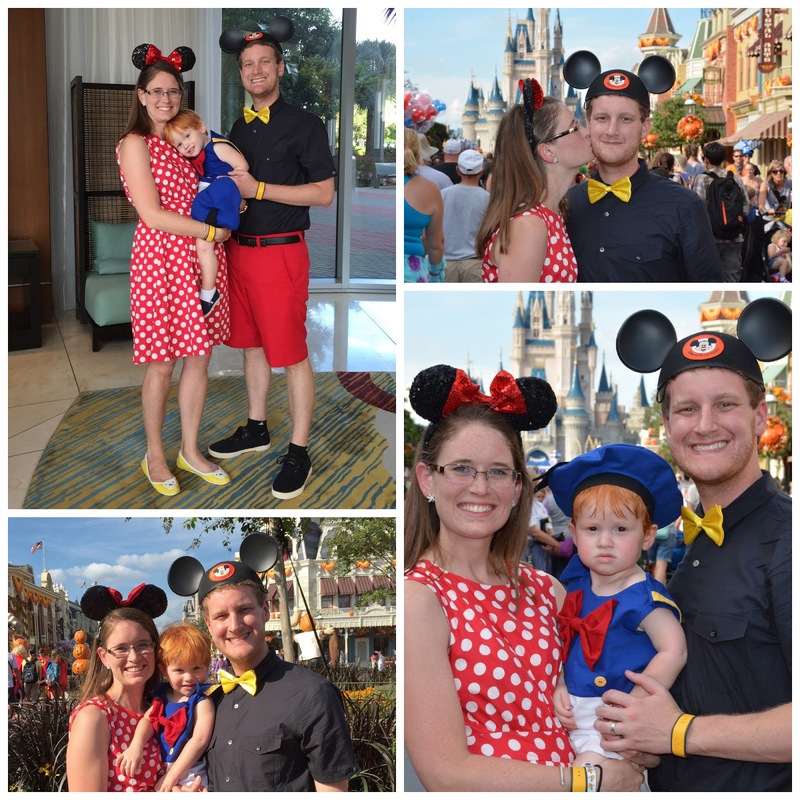 There are so many fun aspects of the party from dressing up, to meeting special characters, trick or treating, the Halloween parade, fireworks, dance parties, and on and on. Add to that short waits for rides, fun snacks to try, and Halloween music piped throughout the park...it is a great time. Before we left, I ordered and printed out our tickets online. I was glad to have them ahead of time because the parties the week we were down there did sell out so we would not have been able to get them the day of. If you are interested in seeing which dates tend to sell out and the most and least crowded MNSSHP party dates, touringplans.com has all of that data compiled in a handy table. 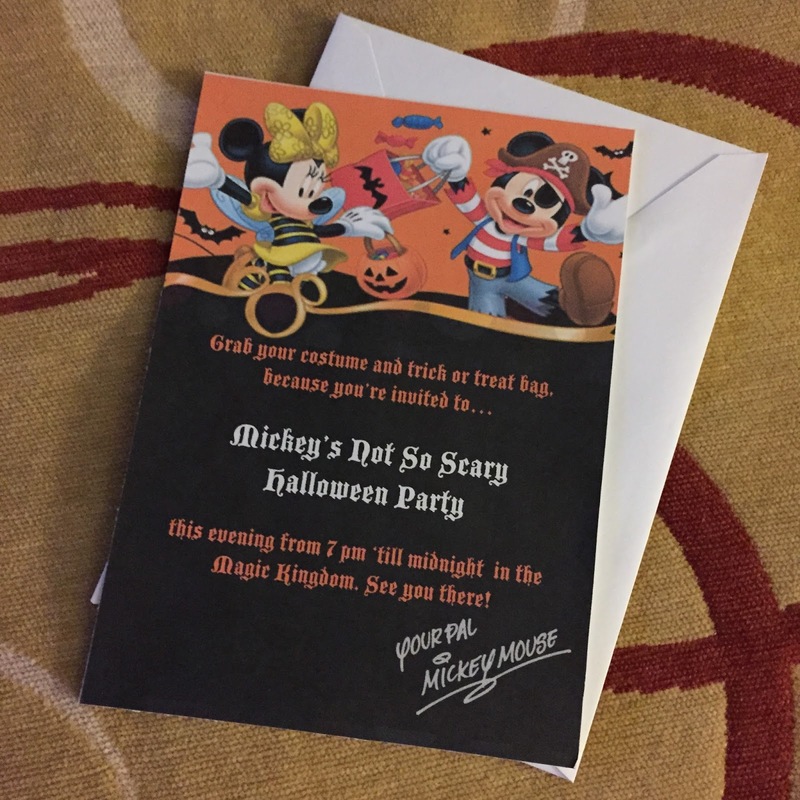 As a little extra magic and fun, I also created a little invitation to take with us and give Perry "from Mickey Mouse." I don't have rights to the image files, but anyone could do something similar with images from the Internet for their own personal use. We knew we wanted to dress up in costume for the party. Almost everyone does. And it is so fun people watching while you are there and seeing all the amazing, creative costumes. I have a thing for coordinated family costumes...I think they are just precious. To the dad I saw who had antlers on his head as Sven alongside his two daughters dressed as Anna and Elsa...well done. If you are brainstorming costumes for the MNSSHP, make sure they are not too cumbersome or hot. Even in October it still feels like summer in central Florida. I was very happy to be in a sundress and Andrew was happy to be in Mickey red shorts instead of pants. 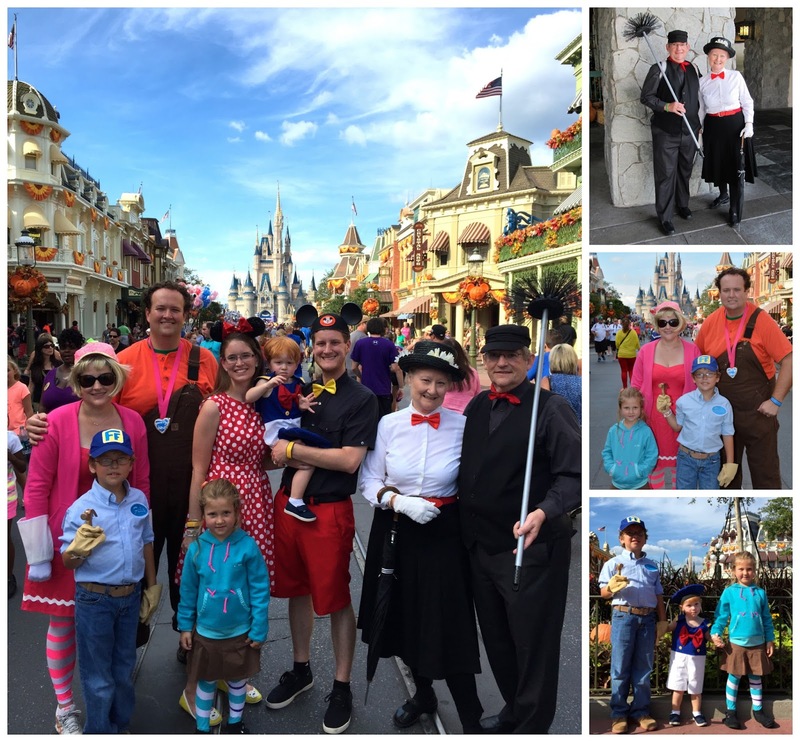 The rest of the family dressed up too, Andrew's sister and her family dressed as characters from Wreck it Ralph while his parents made a perfect Mary Poppins and Bert. Step number one once we got in the park was to take pictures, before we got distracted with party activities, and before the warm Florida weather got to us (and our hair). Those first couple hours between 4 and 7 are great times to focus on pictures and grab a bite to eat before the party stuff officially begins. During this time the park is still pretty crowded as you have partygoers coming in and the day people still hanging around. This is not yet the time for riding rides, unless you have fastpasses. It is good to note that if you haven't used fastpasses earlier in the day, and even if you only have party tickets not an actual day park ticket you can book fastpasses in the magic kingdom between 4 and 7. Once the party starts fastpasses are not available...you don't need them at that point anyway. 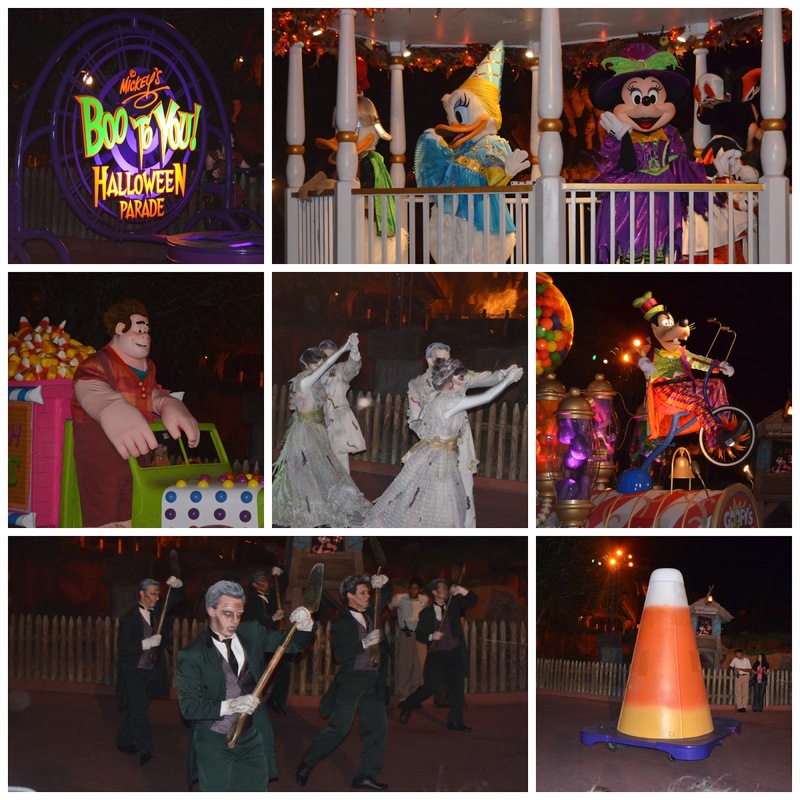 There are two major character sets that you can only meet at special parties like the Not So Scary Halloween Party and the Christmas Party. 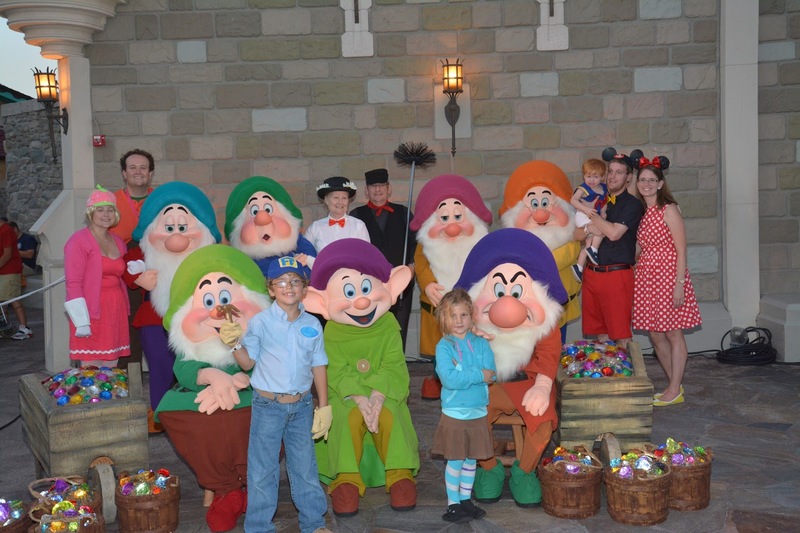 These are all 7 dwarfs (at one time!) and Jack and Sally. Based on our research we knew that lines for these groups would stay long all night so my sister-in-law Emily and I headed to the 7 dwarf meet and greet line about 6, an hour before the party started. At that point we were about 15 families in front of us and the line continued to accumulate behind us. It was well worth the wait when we were in and out and had our coveted 7 dwarf pictures by 7:10 and had the rest of the party ahead of us. My best advice (that we heard and worked well for us) would be to pick the one special character set you most want to get and go get in line well before 7. You don't want to waste party time in long lines. While Taffyta and I stood in line our families went and rode some rides and joined us a little later. What's there to do while two moms stand in line for their families but to take selfies. The dwarfs don't sign. There is no time for that. And they really encourage group pictures so that the line can move as fast as possible. How cool is their set though with all the buckets and wheelbarrows of jewels? 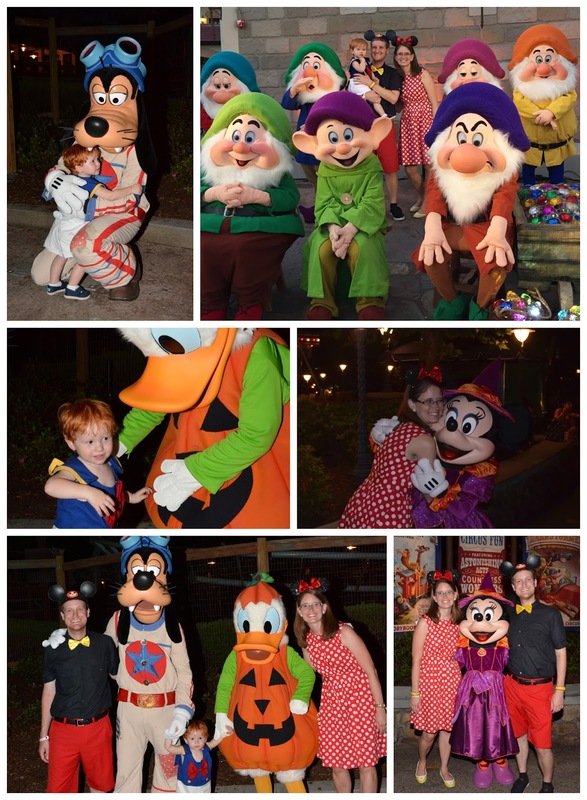 For us personally the other characters we really wanted to meet were the characters we were dressed up as so we went and met Donald (and goofy) and Minnie Mouse. All the classic characters are there meeting mostly sprinkled throughout fantasyland, dressed up in fun costumes themselves. There are lots of villains out meeting as well throughout the park. I think one of the best parts of the party is getting to see the Boo to You Parade. It happens twice each night (weather permitting). The first parade is more crowded because it is more appealing to families with little kids who will be asleep before the second parade which is not until after 10. For that reason we braved the crowds and watched the early parade. The parade is full of characters dressed up in costume, villains, grave diggers, and a very catchy song that will be stuck in your head for a while afterwards. The star is the headless horseman who leads the parade off which is a very cool site to see. He comes galloping by, head in hand, a few minutes ahead of the parade start. There are lots of festive things to eat and drink at the party. We grabbed a quickservice dinner before the party officially started so that we wouldn't have to waste precious party time sitting down for a meal. We had aspirations of trying lots of the special halloween goodies, but were only hungry enough for a couple. We shared a mummy cupcake (chocolate cake) from the Main Street Bakery and then at the very end of the night we shared a pumpkin spice waffle sundae from Sleepy Hollow. I love Belgium waffles and the pumpkin spice was a great flavor. Meanwhile Andrew prefers ice cream so it was a perfect sharable snack for us. Other snacks that we didn't have time (or stomach room) for included ghost cupcakes at Gaston's, candy corn soft serve ice cream, candy corn cotton candy, and bubble teas. I am not a good fireworks photographer. At all. I love watching them though. The Halloween party fireworks are incredible. I have heard they are some of the best the Magic Kingdom has to offer. We didn't sit and wait to have a perfect view, but did pause and watch them from a sidewalk near the hub when they started. They lived up to their expectations for sure. Halloween party fireworks go off at 9:30, between the two parades. If we had a kiddo who would sit still better I would have liked to have staked out a better viewing place in front of the castle. Crowds really start clearing out after the fireworks as lots of families with little kids will head for the exit. We spent the next couple hours doing rides and eating snacks in a relatively empty park. 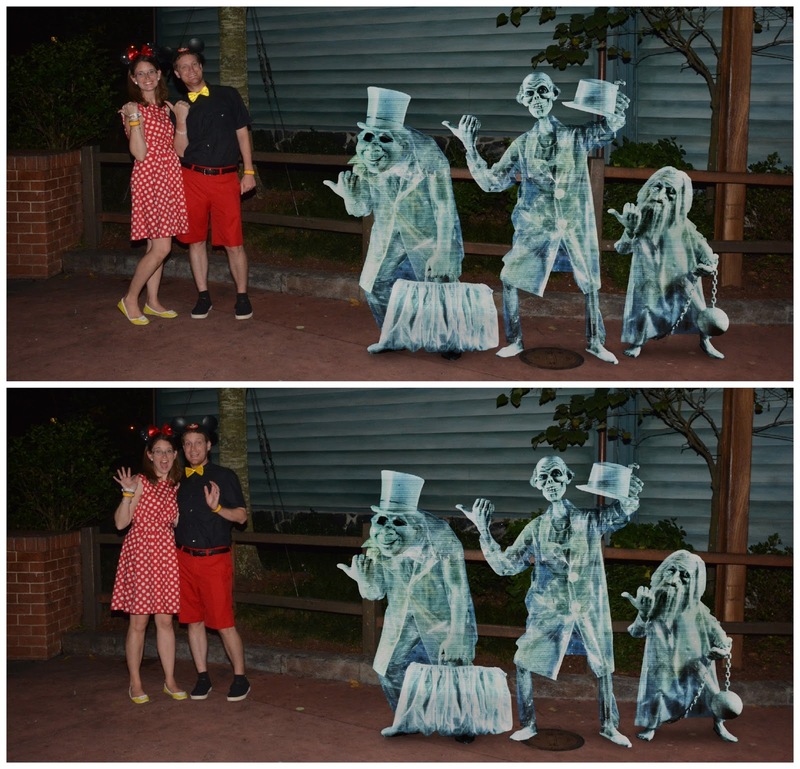 There are some cool magic shots you can get through photopass photographers exclusive to the Halloween Party, such as these with the hitchhiking ghosts. We got these from a photographer stationed just outside of the haunted mansion. I am not a lover of all magic shots, but these are really cute and make me smile. You will notice that we are toddler-free by this point in the night. My precious in-laws decided to head back to their hotel when it got late and took Perry with them to spend the night. We happily allowed him to go and took advantage of the childcare to enjoy every last minute of the party. Photopass photographers don't broadcast their ability to do magic shots or solicit you to take photos. So don't feel bad to ask them (at a special party or otherwise) if they have any magic shots they can do. It is true that almost all rides are walk-on with no wait during the party. Only exception we noted was the mine train which still had a wait but was much shorter than it is normally, and the haunted mansion which is popular given the fact that it is the halloween party. We wanted to ride the haunted mansion (like most everyone else) and at the end of the night decided to stand in a 20 minute wait to do so. May not sound like a bad line, but it was the longest line we waited in the entire trip thanks to a lot of planning. We also rode headliners like space mountain and big thunder mountain with almost no wait. We didn't spend too much time on rides though because we really wanted to focus on party specific activities that you can't do during normal park hours. There are trick or treat stations all around the park, indicated by signs and on the brochure map. They seemed to be quite busy early in the night and by the end cast members were literally working to give the candy away. We didn't do very much trick or treating because a 21-month-old doesn't yet know to ask for candy. But we did let him do it once for the sake of it. Later on when it was just us adults we grabbed some candy a time or two to munch on while we walked. We had an amazing time at the party. If you are find yourself at Disney World in September or October I would highly recommend finding a day that you can include the party into your plans.